Glasgow School of Art has been destroyed beyond repair, say experts, with the costs of rebuilding estimated at more than £100 million. The historic building, designed by Scottish architect Charle Rennie Mackintosh, suffered extensive damage from the fire that started on Friday, 15 June 2018. Glasgow-based architect Alan Dunlop, who visited the site over the weekend, said the destruction caused to the building is "irreparable". 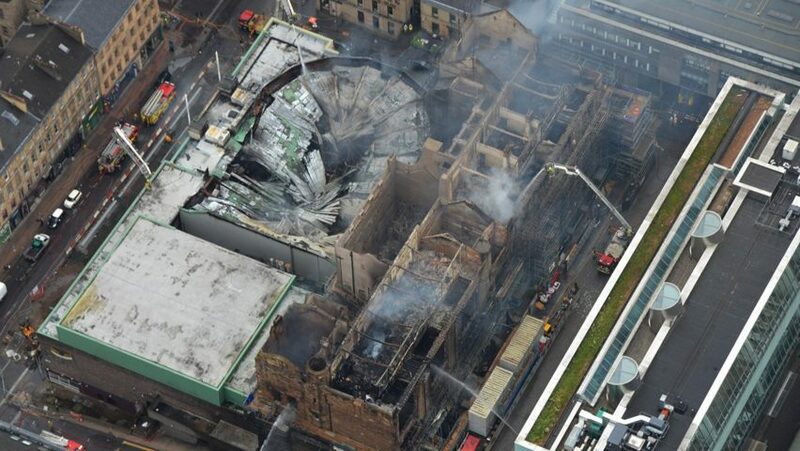 "Mackintosh's Glasgow School of Art is gone," he told Dezeen. "It is certainly possible to rebuild but you cannot replicate 110 years of history," he said. "The students, artists and architects who have worked there, and whose presence permeated the building – that's what has been lost in the fire." "We should resist the calls to rebuild"
Dunlop, who was a student at the Glasgow School of Art and is a visiting professor at Robert Gordon University, Scott Sutherland School of Architecture, claimed the damage is far worse than the school sustained during the previous fire in 2014, which destroyed large sections of the interior. A reconstruction project following the first fire, costing an estimated £35 million, was expected to complete this year. But Dunlop believes that the same cannot be repeated. "It has been destroyed by fire, four years after an initial assault," he said. "We should resist the calls to rebuild it as before, 'stone by stone'. That would not be restoration, it would be replication – a process I believe Mackintosh himself would resist, as he was an innovator, not a copyist." More than 120 firefighters were called to Glasgow School of Art just before midnight on Friday to tackle the blaze, which spread from the building's ground floor all the way up to the roof. Firefighters were able to get the fire under control after several hours. Aerial photographs released shortly after the fire reveal the extensive damage – the roof appears to have been completely destroyed, and many of the floors are burnt out. Billy Hare, professor in construction management at Glasgow Caledonian University, estimated the cost of rebuilding at more than £100 million. "The damage to the school of art appeared to be overwhelming, much worse than the last fire from which recovered materials were painstakingly analysed and used in the refurbishment of the building," he told The Scotsman. "This sort of project will cost a great deal more than the estimated £35 million after the last fire in May 2014." Hare expressed doubts over whether it would be possible to recover the school at all. "It is sadly questionable what, if anything, will be left that could be salvaged, restored or recreated after this fire," he told the paper. "It remains to be seen if it will be possible to retain a facade from the current building. If not, damaged buildings have been taken down almost stone by stone in the past and rebuilt with a new, internal frame." The Scottish Fire and Rescue Service has confirmed that no casualties were reported. Martin Hill, the fire officer in charge of the incident, said that thermal-imaging cameras were used to help them assess priorities during a "tactical firefighting operation". The cause of the fire is unknown at this stage, but investigations are underway. Glasgow School of Art has issued a statement to reassure staff and students that its priority over the coming week will be "ensure minimum disruption". Muriel Gray Chair, chair of the school's board of governors, said she is hopeful that the building can be repaired. "We now have a difficult waiting game until Scottish Fire and Rescue Service, Glasgow City Council and associated agencies have completed their investigations into the condition of the building," she said. "We remain hopeful of as positive an outcome as possible, because it is clear that the love for the Mackintosh and recognition of its importance to Glasgow and the wider world is shared by absolutely everyone." The British Automatic Fire Sprinkler Association has told press that sprinklers were not yet operational in the building, as the refurbishment wasn't complete. "However, it should be realised that sprinklers can be fitted in buildings throughout construction on a temporary basis, as there is a considerable risk from fire during this period," the association told The Guardian. Completed in 1909, Glasgow School of Art is the best-known building designed by Mackintosh, Scotland's most famous architect. Last month marked the 150th anniversary of Mackintosh's birth. Dezeen published a special series to mark the occasion.